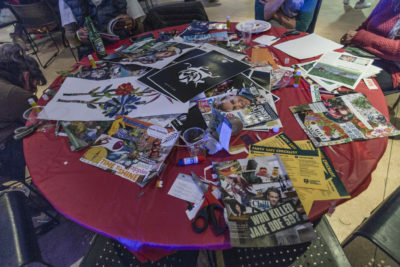 As part of the IDays Social, TRU’s Tourism Management Event Logistics (EVNT 3800) class, with support from the Bass Coast Music and Art Festival, held the latest Collage Party exhibition last Thursday featuring electronic artists Slynk and Fort Knox Five. Participants would individually create collage art pieces in a communal atmosphere that would be displayed as a mural when completed. Billy Collins, the instructor of the course, used this opportunity for students to get hands-on experience in organizing a music event. The Bass Coast Festival and Tourism Management program share a symbiotic relationship as many of the program’s graduates proceed to become valuable employees for them. Despite not explicitly being partners of the event, they are avid supporters of the students and the event management department. The Collage Party according to Collins is part of Bass Coast’s winter promotional tour in anticipation for their festival in July. Paul Butler, the Winnipeg-based contemporary artist behind the premise of the event, came up with the collage inspiration during his time studying drawing at the Alberta College of Art (now known as the Alberta College of Art and Design). Since childhood, Butler would make collages as a form of therapy and would decorate his bedroom with his artwork. Through social gatherings with peers, the term ‘Collage Party’ arose. Through past connections, Butler has managed to exhibit at venues like the Arts Gallery of Ontario, the Museum of Contemporary Art in Los Angeles and La Maison Rouge in Paris, among many other art galleries internationally. Collins and Butler had met around 30 years ago when studying at the University of Manitoba. Collins says the collage idea has resonated with him ever since. Given Kamloops’ last-minute buyer behaviour, the majority of the event’s tickets were sold on the last two days. Collins was verging on pulling the pin on the event.